By careful analysis of the furnace temperature and carbon potential it is possible to determine when the atmospheric conditions are such that carbon will be deposited as soot on all surfaces inside the furnace, including the workpiece. It is obviously desirable to avoid this situation and in Eurotherm Heat Treat control solutions an alarm is pre-configured and can be used to trigger a furnace event. Eliminating sooting protects the furnace lining, maintains the accuracy of the zirconia probe and stops formation of a soot barrier on the workpiece, which can prevent carbon diffusion. A probe clean and recovery strategy can be programmed to occur between batches or manually requested by an operator. A short blast of high flow burn off air is used to remove any soot and other particles that may have accumulated on the probe. During the cleaning and recovery cycle the %CP reading is frozen, thereby ensuring continuous furnace operation. When the output impedance of a zirconia probe increases above a certain level, it indicates that the performance of the probe has deteriorated and that it should be replaced. Using a specialist zirconia input module the Eurotherm controllers have the ability to measure the impedance of the sensor connected to its input and, in conjunction with User Alarms, an alarm strategy can be created to alert an operator of an impending probe failure. Accurate measurement of the furnace atmosphere is critical to the application. Normally a zirconia probe is used to measure carbon potential. The zirconia probe generates a millivolt signal based on the ratio of oxygen concentration between the reference airside of the probe (outside the furnace) and the amount of oxygen atually inside the furnace. Temperature is measured using a built in thermocouple at the tip of the probe. An application specific zirconia function block uses the millivolt and temperature signals together to calculate the actual percentage of carbon in the furnace atmosphere. The condition of the probe is again vital to furnace performance and Eurotherm use many techniques to maintain and diagnose the performance of the insitu probe. 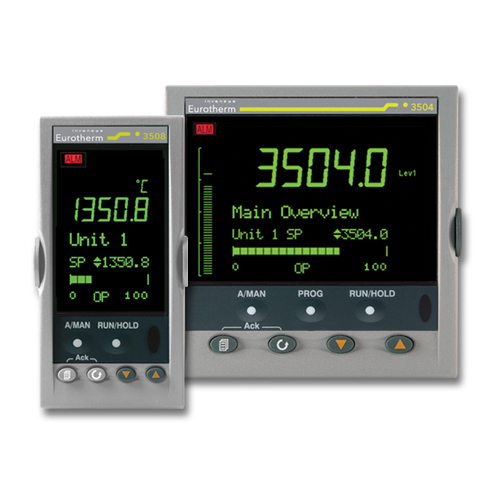 A gas analyzer can be used to determine the CO concentrations of the carburizing gas and fed into the controller to automatically adjust the calculated % carbon reading. The control system needs to cater for or interface with furnace sequencing. The sequencing is required for work-piece transfer through the furnace, cycle control, quench sequencing and burner or energy control. Discrete control solutions tend to interface with an external PLC but, in integrated solutions, it is possible to carry out the entire furnace sequencing in one control environment. For Carbo nitrding it is necessary to introduce ammonia into the furnace during the carburizing process. This can be controlled via sequencing or mass flow control. Quenching of components is an integral and critical part of the process. The quench recipe, which is normally held as part of the overall process profile, will contain options for oil or air quench, the quench oil temperature, time and oil flow circulation speed and direction. The recipe may also include the drip timer setting. Safety measures need to be considered for quench, elevator failure, position and pressure interlocks between the oil pressure and the oil cooler heat exchanger water pressure. The control system must be designed to ensure that the thermal/carbon profile and the quench profile can operate asynchronously. This allows one product to be completing its process cycle in the quench tank while a new product is being treated in the furnace.